Her party was just a small one that she did with 5 of her friends at lunchtime. When they were arriving, we had a Spotify channel full of Disney music playing and they played with pink balloons and each got their own Minnie Mouse ears party hat. It was a good way to pass the time until everyone arrived. Once everyone got there, I had them sit down at the table and I served them lunch. 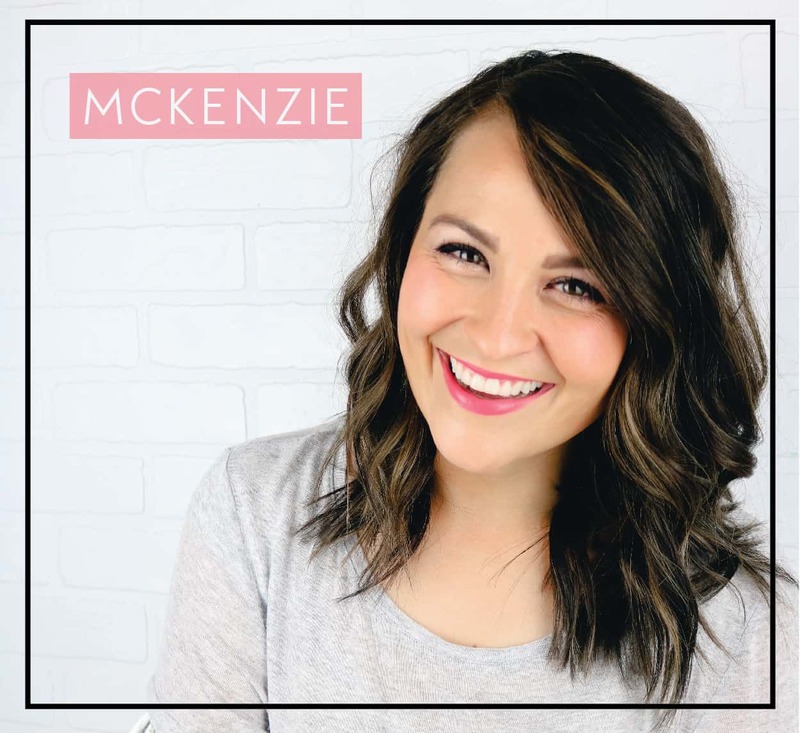 We served hot dogs because of the “Hot Dog Dance” on Mickey Mouse Clubhouse, chicken nuggets, and the cheese that you can get that is shaped like Mickey Mouse as well. They loved it! I had salad there too, but of course it didn’t get touched at all with a group of toddlers and preschoolers. After they ate, we played pin the bow on Minnie Mouse. 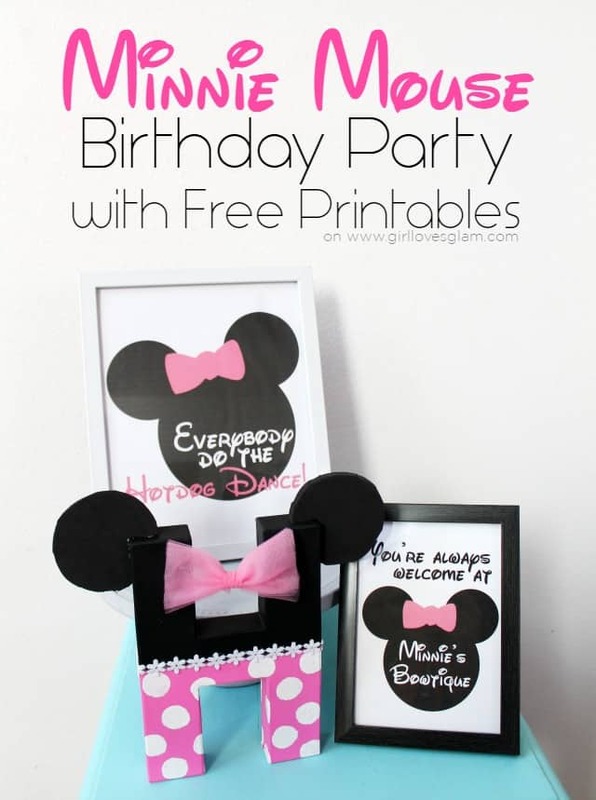 I got a black poster board and traced a pizza pan as the main part of Minnie’s head and then used large lids to trace her ears and used my Silhouette machine to cut out all of the bows on bright pink paper. They all loved this game! After this game, we went back over to the table to decorate bows! 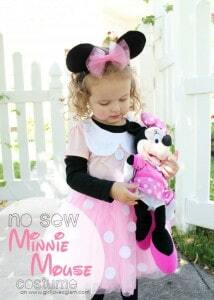 If you have ever seen Mickey Mouse Clubhouse, Minnie Mouse opens her own “Bowtique” where she sells bows. Disney created their own series of short episodes called Minnie’s Bowtique that my daughter adores. 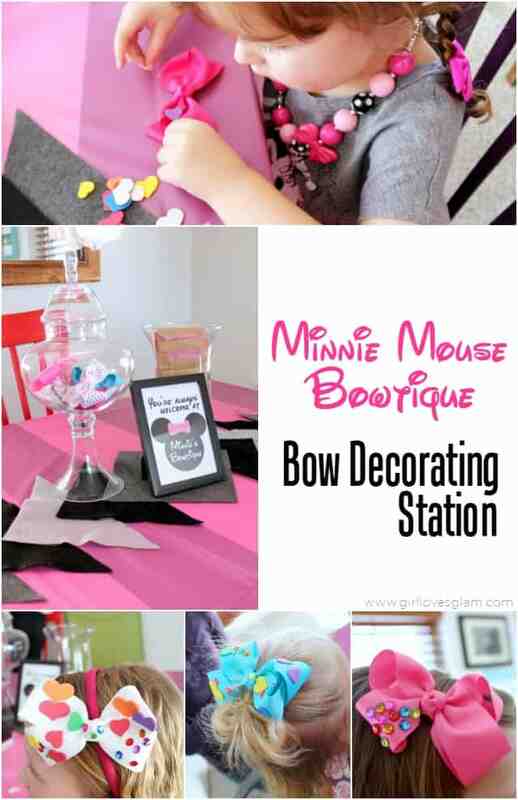 I found premade bows in the baby section of Target that were very reasonably priced and put them in a jar as part of the decor, I printed off a printable sign I made welcoming them to Minnie’s Bowtique, and made little bags with items for them to decorate their own bows with and put them in a jar. I found foam stickers and rhinestone stickers at the craft store that I put in the bags for them to use to decorate their bows. This was a total hit! They loved creating their own bows and wearing them around for the rest of the party. After decorating their bows, they danced around some more, opened presents, and came back to the table to eat cupcakes. While they waited for their parents to pick them up, they danced around and played with the balloons again. It was a pretty laid back party, but was just right for this age group. I am sad that I forgot to take a picture of this, but as a party favor, I got Minnie Mouse coloring books, a small box of crayons, and a pink sucker and tied them all together with pink tulle. They were so cute and simple to put together! I tried to keep everything pretty simple. 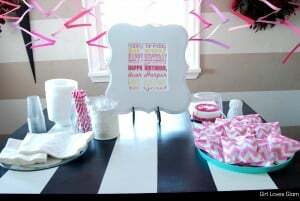 I made this banner using my Silhouette Cameo. 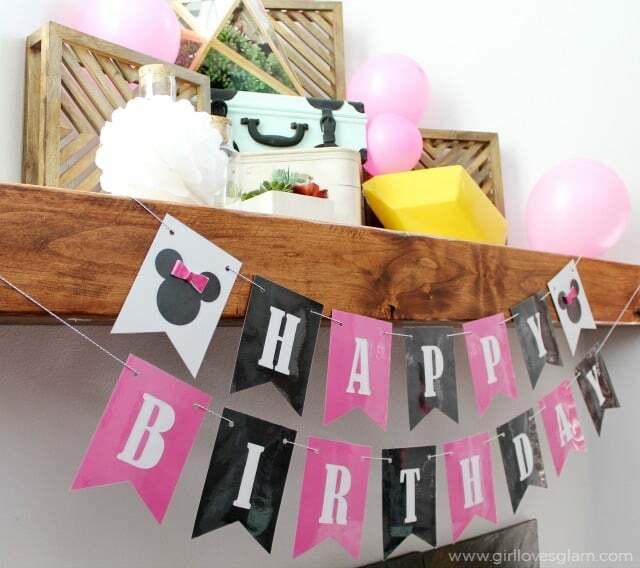 The Silhouette store has a banner template to make the Happy Birthday part of it. I just cut out pink and black pieces to it and backed each of them with white paper. I decided to laminate mine so that I could use it again in the future and not have to worry about it getting ruined. I have a small laminator at home, so this wasn’t a big deal. 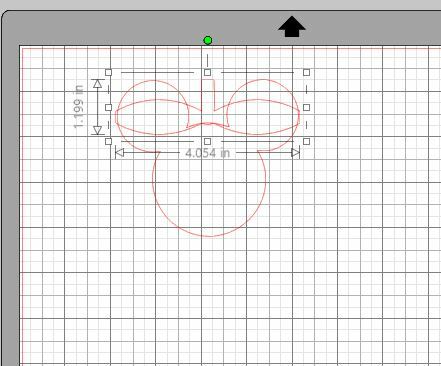 To create the Minnie Mouse head, I went on my Silhouette studio and made three circles to be the size of her head and ears. I went back with the eraser tool and erased the extra lines to make it all one piece. 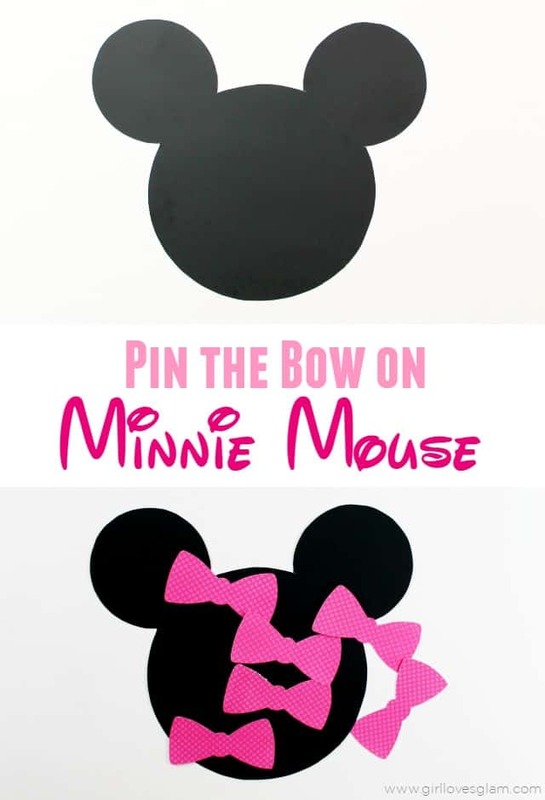 I found this fun, 3D bow in the Silhouette store and laid it on top of my Minnie shape to make sure I got the right size and then separated them to cut them out in black and pink. When I laminated my banner, I laminated it with the Minnie head on the banner, but I laminated the bows separately and went back and hot glued them onto the banner. I absolutely love how it turned out! The Minnie Mouse letter H that I made was something I saw on Etsy. My daughter’s name is Harper, so I made her the H to put in her room after her birthday party. I painted a paper mache letter H pink and black and then went back with a round sponge brush to put the white polka dots on it. I glued white trim between the two colors and made a little tulle bow to put on the top. I cut out circles out of a thick, black craft foam sheet and cut out corners from them so they would slide right onto the H. I hot glued them into place and it was done! 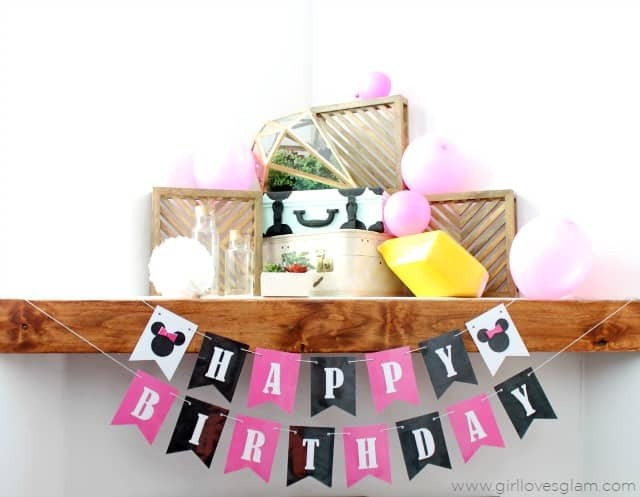 It is a fun way for her to remember her party all of the time now that it is a decoration in her room. 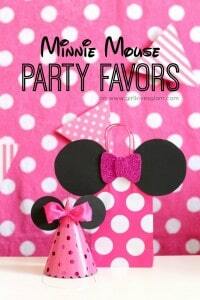 You can find a great tutorial for a Minnie Mouse costume and an easy DIY Minnie Mouse headband below too! 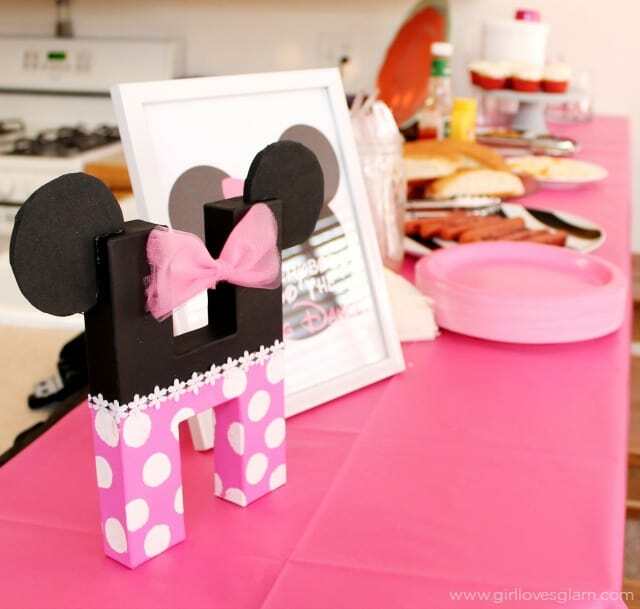 Are you planning a Minnie Mouse birthday party of your own? I would love to hear all about it! 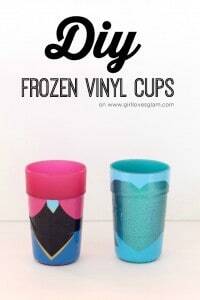 Find more Disney goodies too! 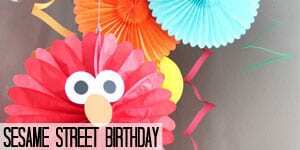 Check out Harper’s 1st and 2nd birthday parties too! So the actual hairbows that were decorated came from target? The bigger ones? Yes! They came in a multi pack. Hi cute ideas, what did you use to decorate the bows? I just got stick on jewels and puffy stickers from Walmart and the craft store!